Our landscapes and marine art, lakes, pond, are of Southern United States, Europe, Nicaragua and the Caribbean. Our flowers are from everywhere. Our sculptures Celebrate the human form in clay and bronze and are subdivided in Bust Sculpture, Relief Sculpture, Figurative Sculptures and Prehistoric sculpture. New pages in Atelier Yoyita. Law, Freedom, Rights, Patriotic themes Still life, true friends, Still life with bowl and vegetables, Still life with tea, Still life jug and fruits, Still life with Italian Earthenware Jars, Bird of Paradise, Rainbow Lorikeet, Parakeets, Hibiscus, Nicaraguan caribbean tropical forest (Go green), Nefertiti (Bust Sculpture) Tuthankhamen mask (Sculpture), Nefertiti, Female in bed (Sculpture), Cotton bolls, Ox cart with Hay, New still life: Fruits and pineapple still life, Tropical fruits and flowers, Pitahayas and tropics, Tropical colored leaves and flowers, Heliconia rostrata, Still life with ferns and maracas. We offer Atelier Yoyita Art gallery in english, spanish, french, german, italian, portuguese, japanese, chinese, Romanian and Quechua. We do have some pages in Russian and Greek. For your entretainmente we have brought to you a virtual Zoological Park, and places as Mississippi and Nicaragua with tropical rainforest. Thank you for visiting Atelier Yoyita Art Gallery, museum and art dealer. 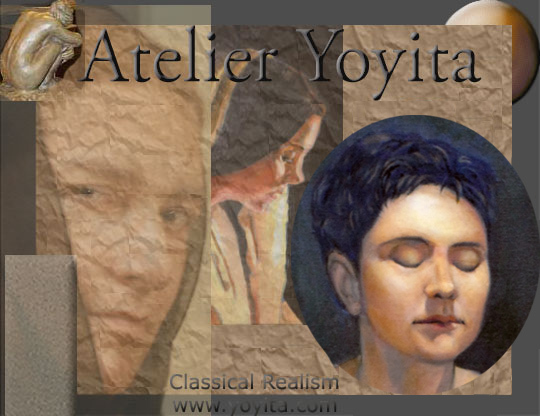 Click here to make Atelier Yoyita your default Homepage Art Gallery in Modern Masters. Atelier Yoyita Art gallery Copyright 1976-2015 Dr. Gloria M. Norris, Yoyita. All Images are protected by Copyright. Use of these images is strictly prohibited from any form of reproduction, transmission, performance, display, rental, lending or storage in any retrieval system without the written consent of the copyright holder. Click here to contact the artist.